A companion lesson to the Eyes on the Prize segment on school integration. 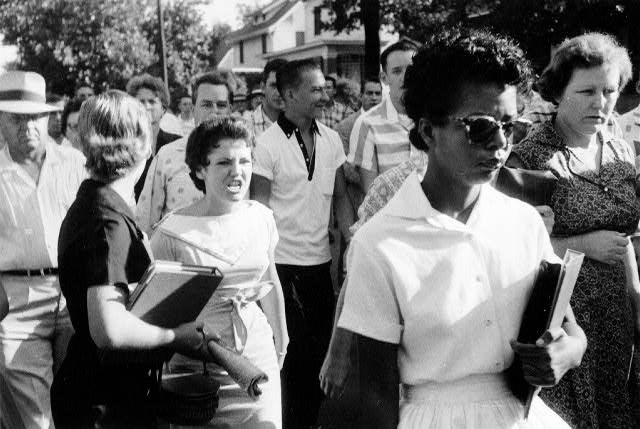 This lesson includes a reading by Elizabeth Ann Eckford about her experience after she was denied entrance to Little Rock Central High School, September 4, 1957. Source: Will Counts. “A school year like no other.” That’s the narrator’s understated description of the 1957-58 school year at Central High School in Little Rock, Ark., in the dramatic episode, “Fighting Back: 1957-1962,” in the PBS Eyes on the Prize series. More than 50 years after heavily armed federal troops escorted nine African American students into Central High School, it’s easy to scoff at the results of desegregation. So black children can go to public schools formerly reserved for whites. Eight of the nine black students walk to their waiting Army station wagon, Oct. 2, 1957. So what? Is life within integrated schools equitably structured? Has desegregation significantly reduced the achievement gap between black and white children? Have income disparities withered away? Can we even say that schools are less segregated than they were 50 years ago? This is not a lesson that attempts to analyze the ambiguous legacy of desegregation. Instead it celebrates the determination and sacrifice of those individuals who were the shock troops in this struggle. And, to a lesser extent, it attempts to examine some of the resistance to school integration. 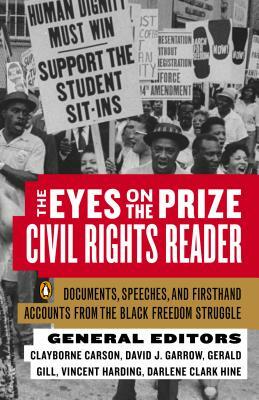 Students watch the video, but through writing they are also invited to “become” the individuals whose lives shaped and were shaped by these key civil rights battles. 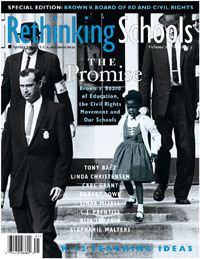 This lesson by Bill Bigelow was published in the Spring 2004 special edition of Rethinking Schools magazine, “The Promise,” on the 50th anniversary of the Supreme Court’s Brown v. Board decision. See Table of Contents. Book – Non-fiction. Edited by Clayborne Carson, David J. Garrow, Gerald Gill, Vincent Harding and Darlene Clark Hine. 1991. Readings to accompany the film, Eyes on the Prize.